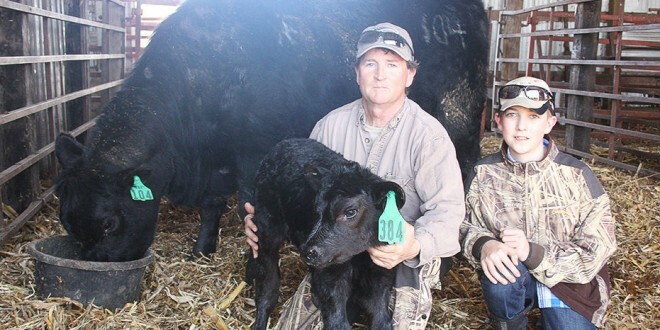 Russell Foster and his son Jay are shown with an Angus calf, born on their farm this April. This spring has been especially challenging for area cattlemen with unexpected snow events that lingered on until near the end of April. South Dakota State University Extension cow/calf field specialist Warren Rusche stated in an online article that he is worried about losses to this year’s calf crop due to the weather. Up until last Wednesday, cold conditions and snow events were ongoing this spring, a big change from last year. March and April only had six days of temperatures above 40 degrees. In 2012, March 5 was the first 42 degree day, and the temperatures pretty much went up from there with 70 degrees on March 13 and 77˚ on March 16. On April 1, the high was 86 degrees in Clark. This year, April 1 was 29˚, March 13 was 28˚ and March 16 was 14˚, and these were the high temps for the day. Spring moisture has fallen in the form of snow and ice versus spring rains this year. According to data at the USDA National Animal Health Monitoring System, over 60 percent of calves that die before weaning are either born dead or lost within the first 24 hours after birth. “For those producers who have planned on calving in early to mid April, historically that has gotten them out of the winter weather. This year, those producers have gotten caught in the ugly transition from winter to spring. We haven’t seen spring yet up to this past weekend. One doesn’t expect to have five snowstorms in mid April. It’s been pretty challenging for those calving in the April 9-23 window. We’ve had a lot of death loss reported. You could hardly design a worse calving time outdoors than we’ve had the last couple of weeks. Weather stress could also cause ongoing problems in the future. Cattle crowded in yards tend to make matters worse in picking up pathogens and spreading disease. A lot are fighting scour bugs as they spread throughout the pen. Russell Foster raises about 150 Angus north of Garden City and says he’s lost about twice as many calves to the weather compared to what it should be in a near normal year. “The worst part was the wind this spring,” Foster said. “I’ve gone through a lot of cornstalks this year for bedding. I’d haul bedding to one side of the windbreak and then the wind would shift the next day and I’d be hauling it to a different side, hoping they would lay on it, to get out of the wind. Most farms are set up for north and west winds, so east winds are a problem. We’re pretty hilly around here, so mud’s not that big of an issue with us. I’ve only got so much barn space and with five to 10 calves coming per day. They need to go out shortly after they come in, as there are more coming behind them. We’ve been fortunate that it hasn’t been extremely cold, the high 20’s have helped. “For the last two weeks it’s been a real draw on a guy physically and mentally. Every two to three hours in the night, you set an alarm to jump on the 4-wheeler and check things out. It can be 5-10 degrees and if there is no wind, a calf would be fine laying in the straw, but that high wind is what kills you, along with all this new snow this spring. Most will lay on the bedding, but there’s always that one mother that will have her calf off on her own in a snow bank. For the most part, a guy really needs to be spending time with them, especially the heifers who end up consuming most of the barn space, being new mothers,” Foster ended. Finstad says he’s about half done with calving in his herd. He has approximately 60 head of Charolais cattle in his operation three miles west of Bradley. “We first started calving on April 9. I’m thinking next year I may calve a week or two later to avoid the sloppy conditions. With all of the snow still around this spring, we’ve had to bed down a bit more. We’re also going through more hay. It’s going to be right down to the wire with our hay supply this year. “Overall I’d say it’s going pretty good. We’ve had two sets of twins so far, that’s maybe a few less at this time last year, but we’re not done yet. It’s been good for the stock dams. Some were pretty dried up last year, but this spring they look to have quite a bit in them; that’s good,” Finstad ended. Clark veterinarian Ted Warkenthien states the weather this spring has really stressed the new calves across the board. “A lot of calves are off to a poor start. Going from 101˚ in utero to a cold snow bank is a big shock to a calf. If the calf is too cold and won’t get up in an hour’s time, it could be chilled to the point of not surviving. It’s important for a calf to get it’s immunity from colostrum (nursing) right away. Not soon enough and not enough of it and the calf will have a weaker immune system. Respiratory problems, scours (calf diarrhea) and naval infections have been a problem this year. Scours especially is more labor intensive to treat, several times a day versus a one time treatment for respiratory infections. “The longer winter has been stressful on the mothers, too. Feed was an issue last summer and fall with a lesser quality hay due to dry conditions, too, giving them a poorer start,” Warkenthien ended. Previous: What helps school lunch changes go down easier?